Please see the map below – “A” is the conference venue. I am arriving at Manchester Piccadilly Train station. What is the best way to get to the conference venue? You can either get a taxi from the rank on the Fairfield Street exit (should cost no more than £5) or you can get on the 147 bus on the road opposite from the station (Fairfield Street). Ask the driver for the ‘Royal Northern College of Music’ bus stop on Oxford Road. Manchester Business School East building is the last building on the left before the Booth Street West, Booth Street East and Oxford Road Crossroads. The fare should be no more than £1 or maybe less. How long will it take to get to the conference venue from Manchester Airport? By taxi this should take no longer than around 30 minutes but do allow for rush hour traffic if you are arriving in the morning. You can also get a train from Terminal 1 to Manchester Oxford Road train station. The conference venue is 10-15 minutes walk. Exit the station and turn right onto Oxford Road. Where is the location of the nearest late night chemist? (Near St Peter’s Square tram-line stop and the Manchester Library). I need withdraw some money from my bank. Do you have any banks nearby? Where is the nearest bookshop? 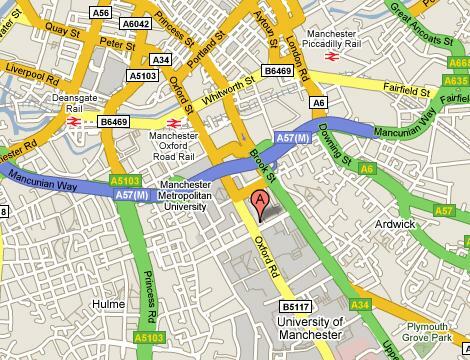 We have a branch of Blackwells 5 minutes walk from the Conference Building on Oxford Road. The building is based on 3 floors. The main entrance is on the ground floor underneath the University Precinct centre next to ‘SPAR’. Where is the nearest A&E? For all accidents and emergencies, the Manchester Royal Infirmary is situated on the corner of Grafton Street/Upper Brook Street, Manchester. Telephone: 0161 276 4147. If you have a non-emergency query, there is also a walk in clinic in the Manchester Royal Infirmary. Telephone: 0161 276 1234. Opening hours are Monday to Friday 10am-10pm Last patients are seen half an hour before closing time. Where are the best restaurants to go to during the evenings? Manchester has a wide selection of restaurants available for your enjoyment. These range from Chinese, Indian, Italian, Thai and traditional UK gastropubs. You may wish to investigate the following links to help with your choice. We hope you enjoy the conference and your visit to Manchester.